Tonight (Sat. 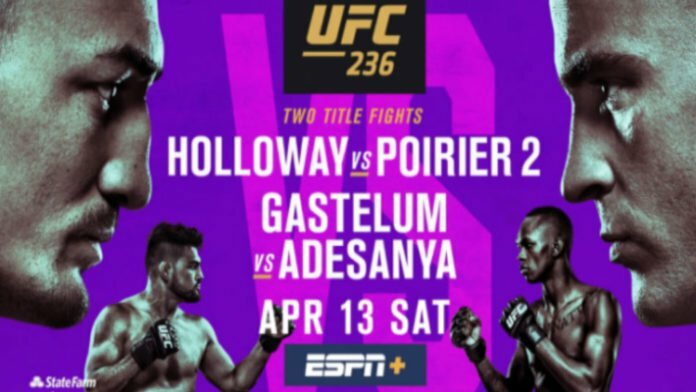 April 13, 2019) UFC 236 takes place live on pay-per-view (PPV) from the State Farm Arena in Atlanta, Georgia. The UFC has two interim championship fights on deck for their featured bouts. First, Israel Adesasnya and Kelvin Gastelum will go head-to-head for the interim 185-pound throne. The winner will unify their title with Robert Whittaker down the line. And in the main event of the evening, UFC featherweight champion Max Holloway faces Dustin Poirier for the interim lightweight championship. The winner of that contest will likely be tasked with welcoming back 155-pound champ Khabib Nurmagomedov once his suspension is lifted this summer. There are plenty of other great fights on tonight’s card.